In March, we set out on a specific geocaching mission: to place one of the travel bugs we had picked up during our travels in February, when we did some Ohio geocaching in the snow. We had held on to this practical little travel bug (a small wrench…clever idea!) for way too long and it was time to help it move on to its next destination…while discovering a new cache in the process. Our hunt took us to a scenic hike that leads off from the Old Fort picnic grounds, about two miles from the Inn. 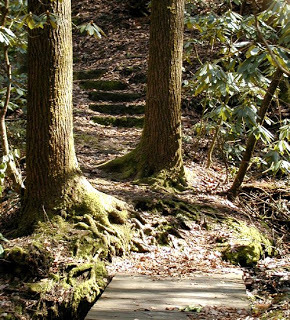 The picnic grounds are a public entrance into Pisgah National Forest that surrounds us here in our neck of the woods. The hike is called the Young’s Ridge Trail and it heads to Kitsuma peak, along more than six miles of mountain trail. 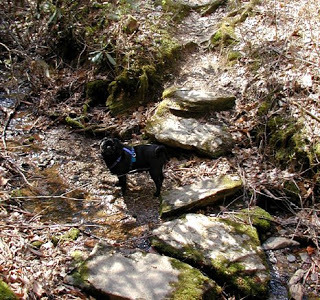 The cache was just outside of the picnic grounds (and the innpugs were with us), so we knew we wouldn’t be hiking six scenic miles that day. 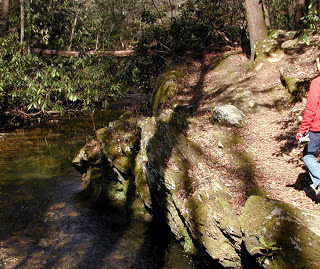 What we did see along the trail were magnificent old rock formations and majestic towering trees along the Swannanoa Creek. We loved walking under tree branches that had grown above the trail into a canopy. We were surrounded by hemlocks, holly, rhododendron and other plants. What a pretty place! Nature at its best. The search involved some moderate climbing off the trail, but nothing Brigette couldn’t handle (which means most anyone could do it). 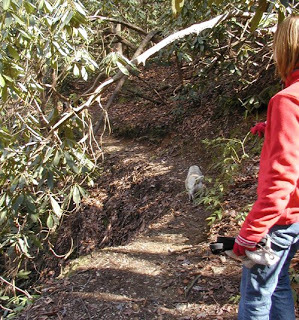 The cache is called Hemlock Cove Cache and serves also as an educational experience for geocachers to learn about the threat to North Carolina’s native hemlocks, the wooly aldegid. Bravo to the geocacher who thought to hide a cache in this spot to help others discover a great hiking trail and to learn about the forest. As some of you know, the Inn on Mill Creek is celebrating its 10th birthday, and we’ve created our Inn Turns 10! list of 10s at: www.innonmillcreek.com/innturns10.htm. There, you’ll find all kinds of lists for activities like birding, hiking and geocaching. Our geocaching list includes 10 of the 125 caches that are hidden less than 10 miles from the Inn, all of which are great for helping you discover our beautiful area of Western North Carolina. This entry was posted in Uncategorized and tagged geocaching, hiking, Old Fort / Andrews Geyser, outdoors by Inn on Mill Creek. Bookmark the permalink.